KUALA LUMPUR: The Government’s proposal to impose a real property gains tax (RPGT) of 5% from Jan 1 may just be a temporary measure, says Taxand Malaysia Sdn Bhd managing director Dr Veerinderjeet Singh. “We feel that it is a temporary imposition. We think that in the long term, the original scale rates of 30%, 20%, 15%, etc will be coming back,” he told a press conference prior to a seminar on Budget 2010 jointly organised by Taxand and the Malaysian International Chamber of Commerce and Industry (MICCI) yesterday. Prior to the exemption of the RPGT in April 2007, tax on gains from property sales was on a progressive basis from 30% to 0% depending on the holding period of the property. Veerinderjeet however, said that total exemption from RPGT would be unlikely. “What would probably not change is the 5%,” he said. He added however that property owners should be thankful that the RPGT was capped at 5% and not higher. 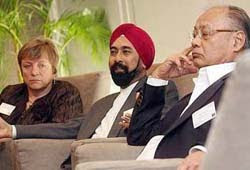 “With the capital appreciation (of our local property sector), the 5% tax is a small price to pay,” Veerinderjeet said. MICCI president and HSBC Bank Malaysia Bhd deputy chairman and chief executive officer Irene Dorner applauded the Government’s push to promote the usage of green technology. “What we need to do is to ensure that in 20 to 30 years, the businesses that we are doing are sustainable. We need to be very efficient in the use of energy and disposal of waste. “And I think that’s exactly the sort of things that the Government should be doing in order to push businesses in the right direction,” she said. Veerinderjeet also said the goods and services tax (GST) was the answer to Malaysia’s “tax revenue predicament” in view of her budget deficit and need to ensure a stable source of revenue. The Government will decide whether to implement GST by year-end once it completes a detailed study of its social impact on the community. “GST is a more stable source of revenue largely because it is a tax on consumption, and consumption patterns normally are more stable than profit patterns,” he said. The one-day seminar, themed Challenges, Challenges & Latest Developments, was attended by experts from member firms of the Taxand global network from Malaysia, India, Australia and Indonesia. PENANG's retail scene is set to see the entry of a new player next year when the RM300 million 1st Avenue opens its doors. The shopping mall, which will be located in the heart of George Town in the third quarter of 2010, will cover seven levels and 400,000 square feet. The project is jointly developed by Asian Retail Mall 11 Ltd (ARML II), the Lion Group and Penang-based Belleview Group. ARML II is the Asian real estate arm for Pramerica Real Estate Investors (Pramerica), which is the real estate investment management subsidiary of Prudential Financial Inc.
AsiaMalls Management (SEA) Pte Ltd chief executive officer Michael Leong yesterday said the new mall is set to be modelled after Singapore retail outlets like Raffles City, Marina Square and Suntech City. "We are looking at bringing in a number of Singapore brands to Penang," Leong told a press briefing in Penang. Parkson Corporation Sdn Bhd yesterday signed an agreement with 1st Avenue Mall Sdn Bhd to be its anchor tenant. Occupying 92,000 sq feet of retail space across four levels, Parkson's 36th outlet is being touted as different and will offer merchandise focused on style, quality and variety. Leong said about 80 per cent to 90 per cent of the mall's tenants would comprise popular retail names and the mall would be zoned according to themes such as "Style", "First Asia", "Unwind" and "Life". PETALING JAYA: New home buyers are expected to make higher payments for their loans with some banks increasing their mortgage rates early this month. A check on the websites of some banks and information collected from customer service consultants at various banks showed lenders like Maybank, Public Bank, Standard Chartered Bank, Alliance Bank and EON Bank had revised upward their mortgage rates. Some have even scrapped the moving-cost element – legal fees, stamp duties and other disbursement fees for loan documentation by the banks – from their home-loan offerings. It is learnt that existing home loans would still be maintained at previous rates depending on the terms and conditions of the contract. Some analysts contacted by StarBiz were caught offguard and were not even aware of the new rates. Others attributed the move to the current thin margins of banks owing to the low base lending rates (BLR) now. Malaysian Rating Corp Bhd vice-president and head of financial institution ratings, Anandakumar Jegarasasingam, told StarBiz that one possible reason for the revised rates by the banks was to boost profitability. “Loan growth for the commercial banking sector has been subdue during the first nine months at an annualised rate of 6.9%, compared to the growth rate of 13.4% in 2008. “However, deposits have been growing at a faster annualised rate of 20.5% during the same period. This invariably exerts pressure on the banks’ interest margins and eventually profitability,” he said. A banking analyst with a local research house concurred that the reason banks were increasing mortgage rates was due to thin margins. “With the price war for mortgage products, it was taking the banks at least three years to break even. That’s why they have the five-year lock-in period in order to reap some profit,” she said. Malayan Banking Bhd president and chief executive officer Datuk Seri Abdul Wahid Omar said the bank had already revised its mortgage loan because he said the current rate of mortgage loan in the country was too low. “We are revising our mortgage rates accordingly. If we increase the rate, we may reduce the rates for other loans such as SME loans,” he said yesterday after the 6th Annual Kuala Lumpur Islamic Finance Forum. He said Malaysia currently had one of the lowest rates in and around the region. “We can’t speak for other banks but from our own perspective, there was a time when we were looking at BLR minus 2.2%. We adjust based on competition. “If we are able to get sufficient number of mortgages at a slightly higher pricing, obviously that’s something which we would look at,” Wahid said. In the current financial year, Maybank recorded a 7% growth in mortgage loans. He said as banks began to move into risk-based pricing as well as the implementation of the FRS 139 framework, they would begin to measure the risk and funding cost of their products. “Banks are becoming more cautious about how they fund their housing loans and the potential risk-reward returns,” Lor said. The above banks have revised their rates to BLR minus 1.8% from BLR minus 2%–2.3%. A mortgage consultant at Standard Chartered Bank Malaysia said the bank revised the rates early this month and expected others to do so in the coming weeks. Existing home-loan customers, the consultant said, would still enjoy the old rates subject to their contracts. According to one of the mortgage consultants at Alliance Bank, the rates had been revised (BLR minus 1.8%) effective Monday. TA Research economist Patricia Oh views the rise in mortgage rates to the expected increase in the overnight policy rate (OPR) by the second quarter of next year. She said the export market had shown signs of an uptick although the current economic figures were still at contraction levels. Oh added that the increased rates would be detrimental to the housing industry as it would discourage customers from owning homes. MARC’s Anandakumar said the move to raise rates was not without its risks as a “significant re-pricing” may eventually increase mortgage defaults and discourage potential loan applicants. Unless the banks tread the line carefully, this strategy could possibly backfire as well, he noted. Meanwhile, HSBC Bank Malaysia Bhd said it was not aware of a potential increase in the average lending rate. “I’m not aware of that,” deputy chairman and chief executive officer Irene Dorner said at a press conference before a seminar on Budget 2010 organised by the Malaysian International Chamber of Commerce and Industry yesterday. Dorner declined to comment further, saying only that the bank’s non-performing loan (NPL) rate was at a manageable state. “We’ve been very pleasantly surprised with our NPL rate which has held very steady and our growth rate has been respectable given what’s been happening in the economy,” she said. A spokesperson for another foreign bank said its mortgage rates remained unchanged. “Our customers have been calling us up to see if there have been changes in the rates and we have advised them that there is none at the moment. “It’s business as usual; we just need to wait and see at this point,’’ the spokesperson added. KUALA LUMPUR: EON Bank Bhd targets to approve home loans worth RM200mil in three months with the launch of its new Super Easi 123 Home Loan Fixed Deposit, according to group chief executive officer Michael Lor. “We are also expecting to rake in at least 1,000 new customers with this new home loan package,” he said at the launch of new home loan product yesterday. innovative product because of its attractive features. “There is a lot of talk of interest rates going up but yet there is one bank that is offering a new home loan option that is pegged against the 12-month fixed deposit (FD) rate,” he said. EON Bank customers to plan their finances better. “Everyone understands FD rates because the rates are prominently displayed and disclosed in our banking halls and website,” he said. The bank’s one-year FD rate is 2.5%, while its benchmark base lending rate (BLR) currently stands at 5.55%. The new loan product is competitively offered at up to FD rate + 1.25% and is available to all customers who apply for a home loan with EON Bank, both for refinancing and purchases of completed properties with a minimum property value of RM200,000. Lor also said the bank was confident of achieving more than 10% loan growth by end of 2009 with the campaigns and promotions launched this year. “The bank had already achieved more than RM1.5bil in home loans as at end September,” he said. Lor said the home loan segment remained important to EON Bank as consumer lending represented 65% of the total value of its lending assets. “In the last two or three months, we saw some positive trends in the economy and it (the economy) will continue to improve following the pro-business Budget 2010 announced recently. “As a result, we can expect business activities going back to normal, then people will continue to invest and buy assets, especially properties,” he said. KUALA LUMPUR: The move by some banks to raise mortgage rates for new applications since this week would not have an adverse impact on the mass residential segment, according to HwangDBS Vickers Research. It said on Wednesday, Nov 4 the mass residential segment will be less affected as those who need to buy properties would still do so. "In the long-run, demand should be supported by improving economic outlook, rising income levels, inflationary fears (property is a good hedge against inflation), and a young population (50% below 21 years of age)," it said. valuations are undemanding at near mid-cycle levels. Its top picks remain SP Setia, DNP and E&O. The research house said it came to understand that some banks had started to raise mortgage rates for new applications since this week. Mortgage rates have been standardised to BLR-1.8% from BLR-2.3%, while banks are no longer funding upfront costs (for example legal fees, moving costs). "Our channel checks indicate that this directive affects only the secondary market for now. Banks are still offering attractive financing packages for new launches. "Despite the minimal 6% increase in monthly installment payments (cashflow impact 11% of property value if include upfront legal fees), this could dent sentiment that had been affected by the recent reintroduction of real property gains tax," it added. However, it expected transaction velocity to decelerate in the short-term (secondary market constituted about 78% of 2008 sales). HwangDBS Vickers Research said it remains to be seen whether this agreement will be upheld and for how long, as the banking system is still flush with liquidity (loan-deposit ratio: 75%). It also did not expect interest rates to remain at record low levels forever, adding that expectations were for the OPR to rise 25 basis points in 3Q10 and 25 basis points in 4Q10). The banks had a similar agreement to raise hire purchase rates last year - the first attempt failed, but banks later agreed on the pricing rationale and rates are now 150 to 200 basis points higher year-on-year and are stable. "We believe developers will continue to offer, if not step up, their incentive packages to stimulate demand. This might affect margins unless they are passed on via higher selling prices. "A new EPF withdrawal scheme that will allow members to tap into future savings in Account 2 (on top of current savings) for property purchase will be announced in January 2010 (according to the 2010 Budget proposals)," it added. LAND & GENERAL Bhd (L&G), a property developer, is partnering its major shareholder to develop serviced apartments in Ampang, Kuala Lumpur. L&G's unit Synergy Score Sdn Bhd (SSSB) and Forward Splendour Sdn Bhd (FSSB) will form a joint venture company, Elite Forward Sdn Bhd (EFSB) for this purpose. EFSB had agreed to buy a parcel of freehold land measuring 10,546.77 sq m from Sazean Holdings Sdn Bhd for RM55 million. KUALA LUMPUR: BERJAYA LAND BHD (BLand) today told Bursa Malaysia it has received the investment certificate from the licensing authority in Vietnam for its Nhon Trach New City Centre Project, which is to be managed by Berjaya Nhon Trach New City Centre (Berjaya NTNC Ltd). Berjaya NTNC is a newly incorporated and wholly-owned subsidiary of Berjaya Leisure (Cayman) Ltd in Vietnam. The later is a wholly owned industry of BLand. According to BLand, the NTNC Project is located on a 1,482-acre tract at Nhon Trach District in Dong Nai Province, Vietnam. The total estimated gross development value (GDV) of the project is RM21.8 billion while the estimated investment cost is RM17 billion. Development works on the project is expected to commence in 2012 and is slated for completion in stages from 2015 to 2030. The project is due to be developed in stages into an integrated township comprising administration, healthcare, educational, cultural and art centres, mixed residential and commercial projects such as apartments, apartments with commercial shops, villas and semi-detached houses. The RM40 million facelift undertaken by the SkyPark Subang Terminal will turn the facility into not only a destination for travellers but also for the surrounding community. "Ultimately, we envision SkyPark Subang as a major domestic and international transportation hub, served by major modes of transport and modelled to reflect contemporary lifestyle elements," its executive director Tan Sri Ravindran Menon said. He said recently that SkyPark wanted to reinstate prominence to Subang as a global aviation hub. Rejuvenation of the terminal in Subang is part of a three-year overall plan with three thrusts, the first of which was achieved with the launch of SkyPark Subang Terminal. The second thrust will be to develop a regional aviation centre, a 30-acre development that includes maintenance, repair and overhaul facilities, dedicated hangarage and aviation-related industries while the third thrust will be construction of a leisure mall with an aviation theme. The revitalised SkyPark Subang terminal at the Sultan Abdul Aziz Airport was launched by Prime Minister Datuk Seri Najib Razak last week. PARAMOUNT Corp Bhd has signed a conditional deal to buy 8.8ha of freehold land in Damansara, Selangor, from The Titular Superior of the Brothers of Saint Gabriel for RM62.4 million. About 4ha will be used to build a new campus for KDU College and the rest will be for commercial properties and condominiums. Paramount will use its internal funds and borrowings to fund the acquisition, it said in a statement to Bursa Malaysia.